Hello fellow DMs! I have been drawing maps for D&D, and just for the fun of it, since sixth grade. During that time I would like to think I have learned a thing or two about RPG cartography, and what players expect and enjoy. 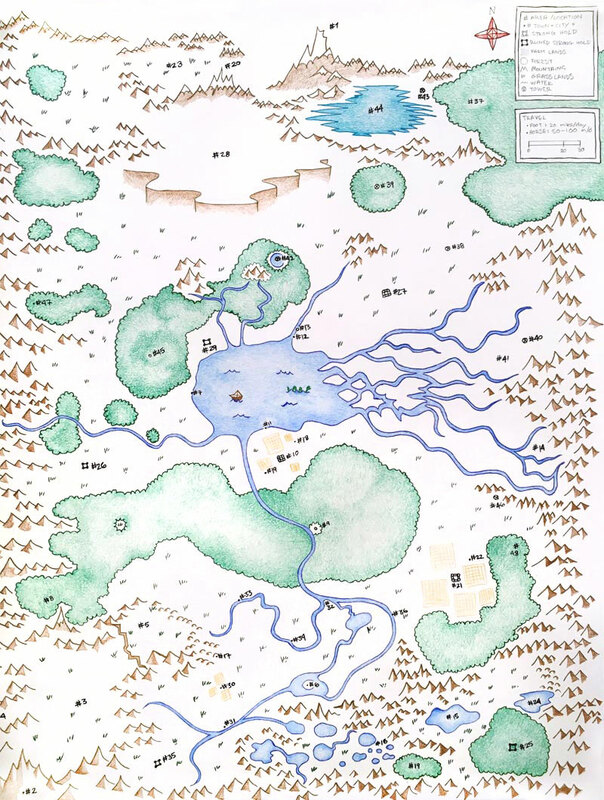 Every good fantasy book has a map and so should your D&D campaign! I would be lying if I said you didn't need any artistic ability to make a good D&D map. That said you don't need that much artistic ability – and it is a much different skill than figure drawing. First I try to decide what my map needs to fit the world, the campaign, and the quests. Does there need to be an ocean for some pirate swashbuckling and ship crushing krakens? Will I need some dark mysterious forests with crumbling ruins to explore? How far between are civilizations? Is the world advanced and will there be big cities? Or is it a "new world" and will towns and communities be few and far between? Consider all these things and the experience that you want to shape for your players. 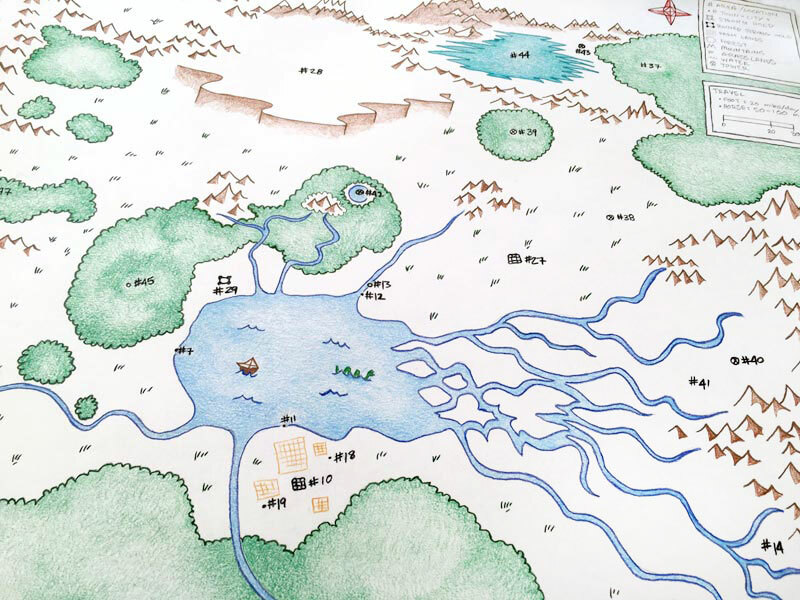 Take a look at a few real maps to get some inspiration, then start the drawing! I typically start by organically drawing coastlines, lakes, and rivers. Nothing special here, just let your hand wander to create interesting shapes, coves, bays, deltas, rivers, lakes, or seas. If you don't like it, no worries, scrap it and doodle some new coastlines until you are happy. Next I plot mountains that interact with the coastlines. This is easy, just draw lots of little triangles and spiky shapes chained together to form mountain ranges. If you look at topography you will see that mountains typically follow the coastlines, cause peninsulas to form, and shape secret hard-to-get-to valleys, and plateaus. Use the mountain ranges to control what your characters will have access to early on in the game and what parts of the maps you want to save for later levels. After I have the water and mountains in I add the forests. This is my favorite part. Just draw a bubbly outline for forests. I have tried many a time to draw tiny little individual trees. This looks cool but it is sometimes too detailed and rarely worth the time. Just shade the forest areas in with a green pen or pencil. Everyone will know what they are. Finally add roads (or omit them), cities, and other places or interest, and speckle some grass icons around the leftover areas to indicate fields. You can label things directly, or if you want to keep things clean, you can number locations and keep a corresponding locations list. 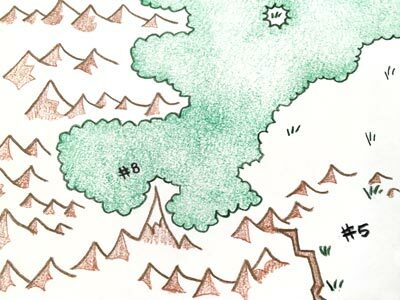 It can be especially fun to not give your players the list of locations with the map and make them create their own as they discover each little numbered location. When you get four or five players and a DM all huddled around the world map it pays big if your map is big. It's not going to be a lot of fun for your other players if they are smelling Timmy's bad breath (equal in stench to his level four Barbarian), as they lean in and squint to try and read the names of locations in your tiniest printing on your little 8 1/2 x 11 map sketch. Big maps are more exciting, more useful, and all around more fun. The world map pictured here is 18 x 24 inches and I find that is a great size for a world map – giving your characters plenty of space to explore and get lost while giving you a finite world to manage. We all know color is more fun. Black and white is acceptable too but can be less magical and less fantastic. Having a nice big color map in the middle of the room or table is a great centerpiece for players to gaze at and get lost in. I'll often do my one-off dungeon or adventure specific maps in black and white, mainly because it is less time consuming, but I have noticed that my players really notice and appreciate it when I put the time in to do a color map for a specific adventure or quest. You can likely double up and re-use these for future quests that happen to pass through the same location. I try to do this a lot because it, 1) makes less map drawing work, and 2) returning to a previous location gives the players a real connection to the world, having multiple experiences at the same place is a lot like reality and you'll find your characters begin to bond with the little destination dots that make up their universe. I highly recommend a big color world map as the centerpiece – it's worth the time and adds a lot. Try to strike a balance between creative fantasy sounding names and fun easy to remember names. A location titled "The Crossroads" on your map is pretty generic and some could argue boring, but it serves two important roles. It describes the location – all your players will immediately be able to visualize it and easily remember its name. If this place is going to be critical to your campaign – maybe it is a good source of quests or a bustling town where they can regroup and buy supplies – then you want your players to remember it. If you name it something like Lorgorothian you may find your players saying, "Um... we go back to that town... um... what's it called again? ", instead of, "Back to The Crossroads for ale and salted pork!" If you want to throw in some flare them maybe you name it, "Erios Crossroads", or "Shadowcross", but try not to make it so esoteric that no one can attach meaning to it. I try to do this in my maps a lot. I'm not totally consistent with it but it does add some friendliness to my world's geography. For example I have locations such as, Snowcrest, Southport, Riverport, Blackwood, and Chicken Valley Farms, to name just a few. I have found that adventures revolving around locations with generic-ish names are more fun because they describe the place and do a lot of the work communicating the location's vibe for you. See below for a complete list of locations on the included map (which I encourage you to use for yourself!). I love doing this. It brings detail and continuity to your world. For individual quests I typically choose a location on my world map to "zoom in on". 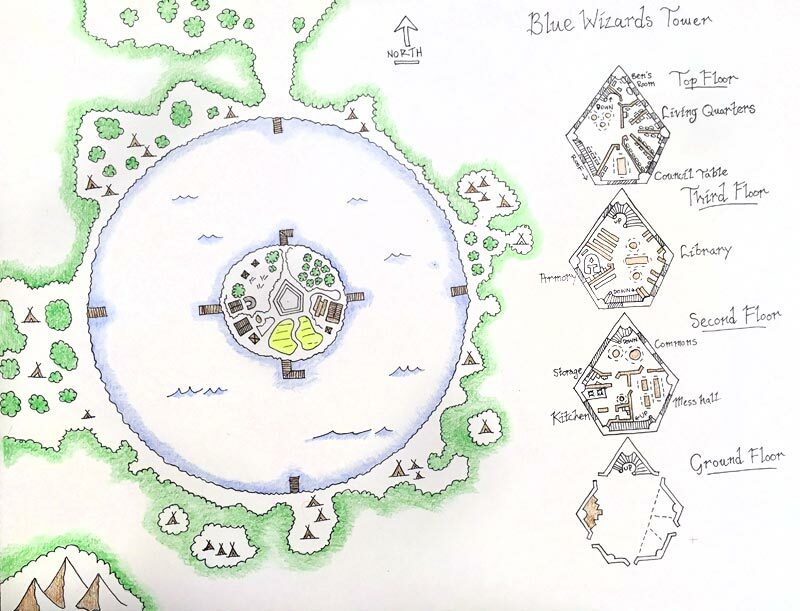 Below is an example of location #42, Blue Wizard's Tower, on the world map above, a circular lake surrounded by forest with a lone island in the center, drawn in close up detail. This fits into the master map and adds detail and meaning to the bigger picture world map. The players in my campaign have had at least three quests that took place here, or at least started or ended here. So this map is not only re-usable, it allows for a tiny little location to gain some scale and unique characteristics. I also have close up of several other locations on my world map but they are not colored so I'll omit them for now. Try to strike a balance between varying landscape types and making your map geographically schizophrenic. It doesn't make much sense to put a jungle next to a tundra, or a desert with rivers all over it. Go for consistency while keeping things interesting and dynamic: a forest filled with good magical creatures, juxtaposed by a dark scary forest on the other side of the river, full of evil diabolical creatures. Keeping it fun doesn't mean you have to have one of every type of landscape on your map. Don't get too caught up on travel time with your characters. I used to do this too much when I DMed. I made getting from one destination to another a long a laborious survival challenge. Making the characters set up and breakdown camp, hunt for food, defend themselves, etc... While these activities can be fun and break up the constant questing they should be used in moderation and entire sessions shouldn't be spent just getting from one city to another. Thanks for reading. Hopefully it was helpful! Hit me up on Twitter with any questions or comments! Here is a list of locations that relate to the master world map above and used in the Cursed Helmet campaign. Feel free to borrow or pickpocket any of these names or maps!